Very satisfied with the quality and look. Give your bedroom a simple and clean allure with the Madison Park Rianon 3 Piece Cotton Waffle Weave Duvet Cover Set. The 100-percent cotton duvet cover and shams feature a waffle weave that provides a soft textured look and feel. The button closures allow you to place a comforter insert within the duvet cover and the internal corner ties prevent it from shifting. Decorative wood button details also adorn the face of the duvet cover and shams for a charming and functional accent. 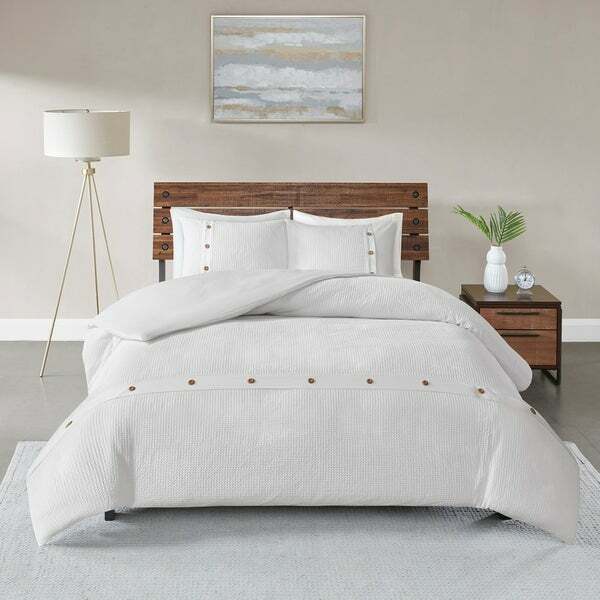 With a fresh contemporary style, this white duvet cover set is machine washable and pairs perfectly with any bedroom decor. I loooove this Madison Park Rianon WHite Piece cotton waffle weave duvet set is so pretty! The button detail is so pretty and the wood tone pops against the fresh white cotton. "What is the thread count of this duvet? Thx TC"
It is waffle fabric and does not have a thread count.